The pair were using a gas cooker to warm the boat overnight as they slept. Timothy Bowman-Davies had pleaded guilty to breaching safety laws but claimed he was not aware the men were using the cooker for heating. 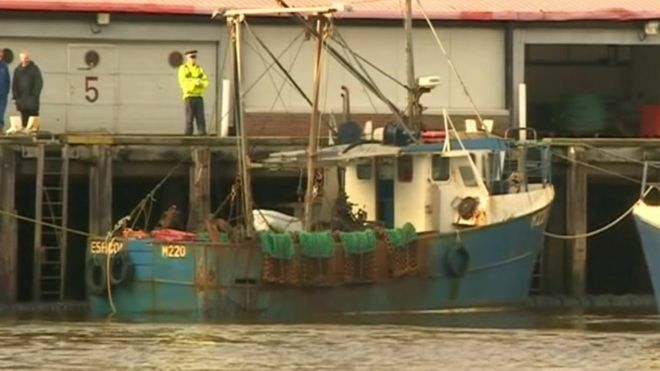 Bowman-Davies, 44, of Haverfordwest, Pembrokeshire, had told Leeds Crown Court he was unaware of the risk of carbon monoxide on boats and did not realise he needed to have the cooker serviced. Judge Tom Bayliss QC rejected his argument and jailed him for 15 months. "Two men have died," he said. "Those who employ others and whose actions create a risk of harm must take the consequences when harm results, such as here." Mr Arries and Mr Ide had joined the boat, called the Eshcol, to fish for scallops on 8 January 2014 and returned to Whitby harbour in the early hours of 15 January. They were found dead in their bunks with the gas cooker grill switched on later. An inquest jury in 2014 returned verdicts of death by misadventure. Bowman-Davies had admitted failing to ensure the boat was operated safely and admitted failing to ensure equipment on the boat was maintained efficiently.